You have probably noticed I like to review interesting and sometimes even weird products. In general, I like gadgets, all sorts of gadgets and devices. That is why today I wanted to take a closer look with you at one very interesting device - the Majority Peterhouse Graduate Internet radio with Spotify Connect, wireless WiFi connection and few other interesting features that I will share with you in the next lines. Currently I listen music mostly from my smartphone, the all mighty Samsung Galaxy J5, which I connect to the JBL Go portable speaker or to the 2.1 Logitech system I use at my desktop. So far this configuration works just fine for me. It is very rarely that I use headphones on my smartphone and laptop as well. 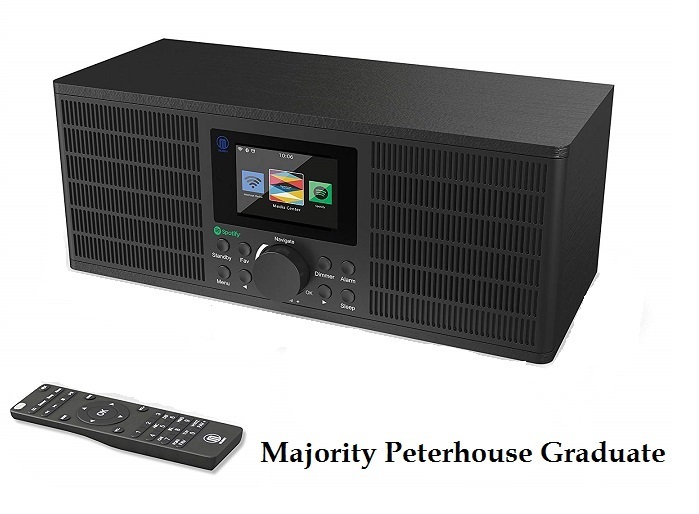 But I think such radio like the Majority Peterhouse Graduate would be a good solution and add-on to the kitchen interior where I would be able to easily connect it to stream some good music. As I still haven't fully tested the Majority Peterhouse Graduate my biggest concern is about the sound quality which might be compromised since the Majority brand is not world famous with quality sound products. Internet Radio: Connect to your WiFi to encounter thousands of stations from every country all over the world, or enjoy local radio. Simply connect the radio to your WiFi connection to begin the adventure. Connectivity: Play your own audio via Bluetooth, UPnP, AUX-In or plug in a USB stick to play MP3 files. Also use the USB port to charge your devices for added convenience. Functionality: Control your radio and settings with the remote control. Create dual alarms, snooze your alarm, set timers and other fantastic functions. Spotify Connect: Connect your Spotify Premium account to the Spotify Connect function of the radio to easily begin playing playlists, albums, podcasts and songs for whatever audio experience you desire. Well, this was my quick overview of the Majority Peterhouse Graduate Internet radio. I hope I will have the chance to order one soon and make a full review for you. And if you are new to our site I would suggest you to check our full list of consumer product reviews here.